Hey hateful hater, big churches can be beautiful too. Or: Some churches I like and why megachurch pastors should be reading the cultural tea-leaves. Even friends are beginning to ask, “Why are you so anti-mega church?” I would like to say once and for all that I am NOT against churches being large. I hope every church preaching Jesus grows. I want the Kingdom of God to be extended. I believe the local church in mission to the world is the biblical, historical, and reasonable way for that to happen. I am also not against large church pastors. Some of my best friends are large church pastors (sorry, I couldn’t resist that one). But, honestly, I don’t know a single large church pastor who does not love God and want others to know Christ. I am certain there are pastors who are shysters-there are shysters in every profession. I just don’t know of any of those, and I know a pile of pastors. So what am I doing critiquing the dominant model of church on the American landscape? Merely raising questions about uncritically held assumptions. Why? Because EVERY good thing has a downside. Unanticipated consequences exist for every “win.” God can and does bring good out of bad…but correspondingly, every good thing has bad that can come from it. I am simply looking at our current popular ministry practices and asking, “Does anyone see the backside of this coin?” Is anyone asking, “Where will we end up if we keep driving down this road?” I have been quite surprised at the defensiveness this has caused. A defensiveness, not of core issues of the faith, but of a vision of the church less than 40 years old. Scottsdale Bible Church, Scottsdale: (7000ish) They planted churches and then began to do multi-site video-venues. I don’t like that part. However, they have trained and developed leaders for their own and many other churches, and they have actively given their people and money away to scads of other churches. Mission Community Church, Gilbert: A large, fast-growing suburban church that reinvented itself as the Micah 6:8 “Do justice, love kindness and walk humbly with your God” church. They have an army of suburbanites thinking about giving time, talent and treasure to create good in the world. New City Church, Phoenix: (600) Discovering liturgy, developing young adults, trying to take people deeper. This fast growing church is riding the wave of young adults moving to downtown Phoenix. Church of the Resurrection, Chicago: (1300ish) They have tripled in the last five years, almost all with college and young adults. Liturgy, charismatic gifts, an army of rotating musical genres, robust Christian education from Wheaton College professors, and a youngish senior pastor who might be the oldest guy in the building. Church of the Incarnation, Dallas: (1500ish) A fast growing traditional church in the central city. Lots of different musical genres, solid liturgy, strong teaching. Decided they needed to raise double-digit millions to expand. Raised almost twice that much. Church of the Holy Cross, Sullivan’s Island: (1000ish) Great youth ministry led to great men’s ministry. A church specializing in venues of 300 or smaller for services to become the church where “everybody knows your name.” An interesting vision in a small beach town. St. Barnabas on the Desert, Scottsdale: (700) Not a large church, but my money is on them becoming one. They have several hundred folks involved in contemplative practice, preach from a humbling level of prayerfulness (the senior pastor prays like 25 hrs a week), a group of retirees will serve anyone, anytime, anywhere, and they have a creative young staff. There are a lot of churches that love people, have committed volunteers and want to share the Good News of Jesus. What do the churches on this list have in common? 1) They teach the Bible 2) They value young people 3) They foster relationships 4) They have a desire to take people deeper in Christ and do that by helping them engage in Christian practices and serve rather than just learning dogma 5) and more and more, they are exploring the totality of Christian history as part of those practices. So, there are big churches that I really like. And, yeah, in light of a growing mountain of data, I do have serious questions about the way popular Christianity is doing Church and whether it has staying power. Again, I am not criticizing motives but rather methods. I am leery of the way the Church has hitched its wagon to the culture of preference. When the culture changes, and it is changing rapidly, what will a church built on being “relevant” and “just like” the culture do? Will it give up beliefs and sit with empty buildings? Or will it change its theology to remain “relevant”? For centuries large swaths of the church embraced slavery to keep the seats filled. What will this generation’s slavery be? What will pastors be willing to preach or willing to stop preaching to keep the lights on? Pastors can defensively criticize the messengers or look at the data and try to be in front of the trends when they arrive. The failure to anticipate change in a big-box facility has catastrophic potential. If current directions continue, the donut hole of young adults will become entire missing generations. The original mega-church, the Crystal Cathedral, was sold in bankruptcy to a new Roman Catholic diocese in 2012. The Crystal Cathedral will not be an isolated instance. That is not “hating.” It is sounding a warning before our suburban churches, built as surrogate main streets for housing tracts without town-centers, become ghost towns. Big can be beautiful. It can also be sold at auction to the highest bidder when the culture takes a left-turn evangelicalism missed. Including: Luis Lugo’s, “The Decline of Institutional Religion”(goo.gl/DiR6A), which describes 2008’s Pew Forum report that those in their 20s and 30s attend church at one half the rate of their parents and one quarter the rate of their grandparents. Brett Kunkle listed seven other such research reports in 2009 (goo.gl/s1vnv). Depending on the researcher, between 60 percent and 88 percent of churched youth will not attend church in their 20s (Time, 2009, Lifeway, 2010). Last year the Pew Forum confirmed the data in a follow-up carried in USA Today (http://wp.me/p2Gq9e-4u). As did this year’s “Hemorrhaging the Faith” study from Canada. Wow. Our brains are so working on the same wavelength these days. You’ll have to check the comments on my most recent post. 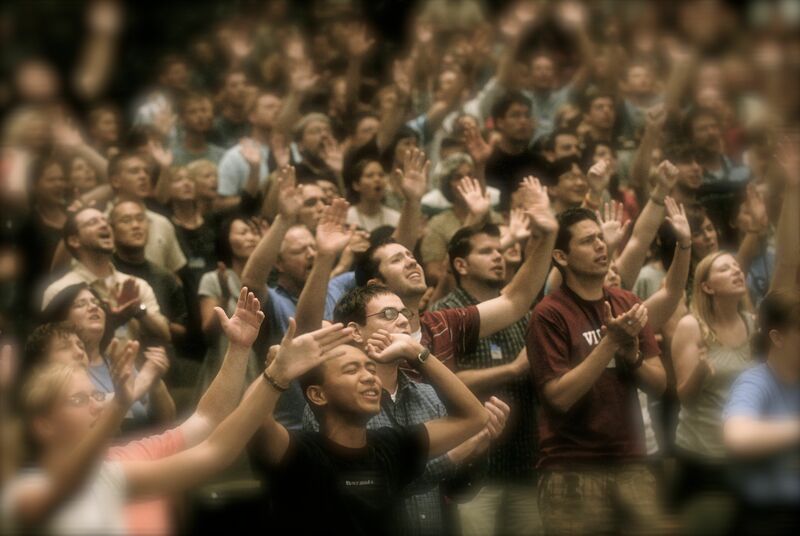 I agree that mega-churches do lead a significant number of people to Christ. I think where I’m struggling is in terms of orthopraxy…Is it okay to open a worship set with Katy Perry’s “FIrework” in order to wake the congregation up, and make them emotionally available to say, “God of Angel Armies”, or even “Come Thou Fount of Every Blessing”? My fear is that the increasing ambiguity between the Church and the greater culture is going to dilute our message. Good piece! Looking forward to Snark Week! Pick a topic and lets line some brutha’s up! Hey Matt, I love your blogs, don’t like the “snarky meter”. Here’s why. In Corintheans Paul says, “All things are lawful, but not all things build up the body of Christ”. Paul was dealing with an audience that was way snarky. He was saying that “building up” is most important. It’s easy to be snarky, it takes love and patience to build up the body. The internet is full of snarky stuff, it’s what get’s headlines, draws attention, creates buzz. But it doesn’t necessarily build up the body of Christ, which is what the church is about. So what if you measured your blogs on this scale “Tore Down the Body….Built Up the body”. That makes it more personal. When I write or blog I like this language becomes it reminds me that I’m talking about Christ’s body, thus I need to be careful. “Snarky” just seems nasty to me. There are Emergence bloggers out there who are very Snarky. Makes me wonder whether they really care about “the body”. I love the Body of Christ and want its health and thriving. My intent is never to tear down. I was not aware of the negative connotations to “snark” and was using it in the way the 16-25 yr olds in my living room use it: tongue in cheek sarcasm among friends. It isn’t really an accurate “meter” since I actually only have one post (“I’ve been found out”) that is sarcastic. There might be a better one-word description that has less negative connotations to it. I will ask around and see if others find it negative and, if so, find an alternative. Good post! I agree that the size of the church is not what’s in question; it’s the teachings of Jesus Christ that needs to stay true to the Word of God in order to not be heresy. I am finding that being culturally relevant is actually anti-Biblical. We, as Christians, cannot keep one foot in the world and expect for our lives to not be touched by the world. That’s the scary part of “relevancy.” It’s a dangerous road that cannot be supported biblically. And guess what? The Old and New Testament are filled with teachings on how Christians should live contrary to the sinful nature. Thanks for shedding light on a subject most people would not talk about. This is how edification happens. Thank you for commenting, Audra Gayle. I appreciate your tagging in on this. I find that I am constantly trying to figure out how to “be ye separate” in my own life. I cannot imagine the difficulty in trying to figure it out for 20,000 other people. God bless those guys! They need our prayers. Hey Matt, I think the debate on size of churches misses the point. Size is a strategy, not an outcome. I think you and your critics are focusing on strategy rather than outcomes. No matter what the size, the question is , “Are we doing practices in this setting that help people grow in faith?” And do they do these faith practices in multiple settings, not just in the god box? I have never heard anyone postulate size as a strategy. I would be very interested in breaking that down. I have said that attractional is a long-term mistake. People have attacked me as “anti-megachurch.” I would say that I am asking questions about attractional as a model and the sanctuary as the locus of evangelism. Growth is an important metric. An Episcopalian named Tom Ehrich postulates that size is unimportant. I would say that the only people who say it doesn’t matter and are unhelpful metrics are people in shrinking churches-like us, for example. Healthy things grow. I argue that Sunday Attendance numbers are not necessarily a Matthew 28 Great Commission measurement…which is what I think you are saying from another angle with your practices question. Thank you for helping us think through these things. One exciting audience of this blog are young adult youth/college/young adult ministry people in large evangelical churches. They are looking at the data and are very, very interested in these conversations.